I have debated and debated (and debated) on whether or not to get another pair of Stuart Weitzman OTK boots (I already have the Lowland style, see them on me here, here and here). But finally I decided on the new Hiline style in black. I have had the boots a few weeks and worn them a ton already so I wanted to do a full review in case anyone else is on the fence (or may be on the fence about them next year). 1. Heel height - I know that may seem like a con, but I was looking for a higher heel and these fit the bill perfectly. I like that the heel is slimmer but still chunky enough that it doesn't make me feel like I'm walking on a stiletto. 2. Comfort - Yup, I find that these are extremely comfortable even at such a high heel height. The pitch is not too extreme so the balls of my feet don't hurt while wearing them. 3. Slim fitting - For me, this was a pro because they stay up better since the fit is so slim. However, if have more muscular legs it may be a challenge. Compared to my Lowland boots, these are actually much tighter. I am not sure if they will stretch out over time, but for now they are definitely very fitted. 4. High up on the leg - These come up higher on the leg than I anticipated and much higher than my Lowland boots which I like because it really helps to elongate my legs. I also find that when they begin to slouch down as I walk around (only minimally) a good portion of them is still well above my knee so it still gives an OTK appearance. 1. Ankle bunching - I do not know why but the fabric bunches more at the ankle with these than my Lowlands. I am constantly trying to straighten it out, but to no avail. After taking some pictures with them on, I realized that it's not as noticeable as I thought it was. 3. Tight at the upper thigh - While this is what helps them stay up, they are much more fitted at the top of my leg so I can't wear them with a short skirt or dress. The dress needs to come down to meet it or I need to wear with leggings/jeans so I don't have any of my leg being squeezed out. #notcute However, if you have very skinny legs and struggle with finding boots that aren't too baggy, this feature would be a major plus for you! 4. Finger marks on the thigh band - I noticed within the first few days that the suede was showing my fingerprints at the top of the boots from when I pull them up throughout the day. I'm sure it's the oils from my hands affecting the suede, but it's more noticeable on the black than on my burgundy Lowlands. As you can see, there are the same amount of pros as there are cons but that doesn't mean that I am not happy I purchased them because I am! Even though there are some features I don't like, the aspects of the books that I do outweighs the negative parts. And as far as the color, I debated getting gray or brown but in the end felt that I would get the most wear out of black. If you have any questions about the boots that I didn't answer, feel free to leave me a comment or email me! 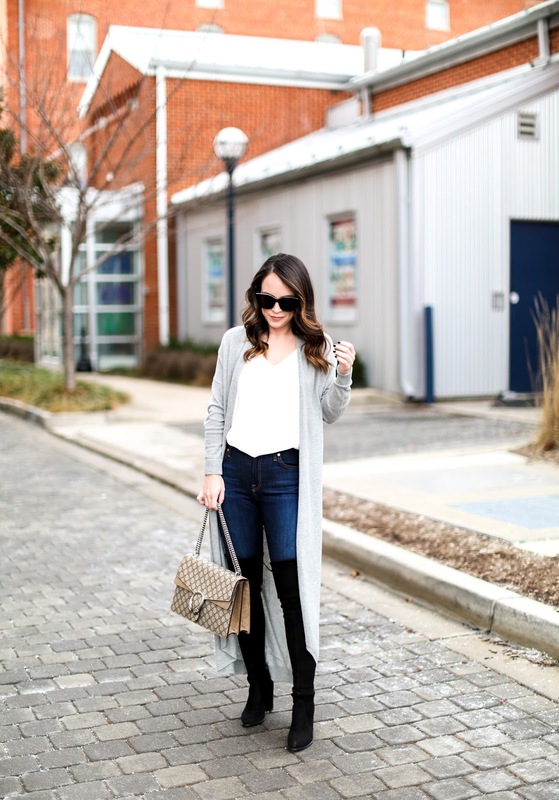 Love this duster! It looks fabulous. Your hair looks amazing - new haircut? xoxo.